In March 2018, we celebrated International Women’s Day by dedicating a special series for some of our female leaders at NuVasive. What is International Women’s Day (IWD)? It is a global day that celebrates the social, economic, cultural, and political achievements of women all over. In addition, IWD marks a call to action for accelerating gender parity. Internationally, purple is a color for symbolizing women, signifying justice and dignity. At NuVasive, our mission is to paint the world purple and continue to change as many patient lives as possible. Pairing the two purples together, we hope NUVA can help drive the movement to increase unity, advocacy, and action in our society. 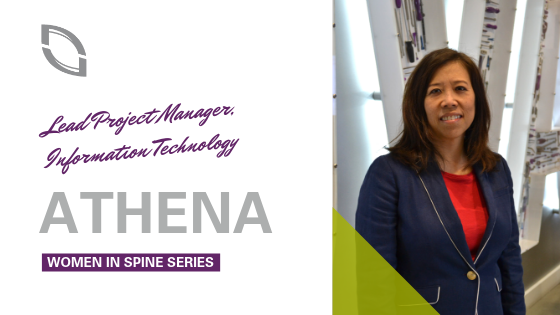 Featuring our first 2019 #WomenInSpine feature, Athena, Lead Project Manager of the IT Project Management team. My mother inspires me. She taught me the value of an education and hard work. She also taught me that if a project or an outcome did not meet expectations, to take a pause and learn from it. It is important to be self-reflective instead of rushing on to the next project or activity. What advice would you give to other female professionals in IT Project Management? In IT Project Management, you learn by doing. As a project manager looks to expand his or her project management skill set, it is important to seek out different types of projects whether it is a new software application you have not worked on before, an IT network infrastructure project, or a software project. It is also important to escalate high risks or issues in a project on a timely basis. Asking your leaders for a resolution early can potentially decrease the impact to the project versus if you were to wait longer (e.g., significant delay in schedule, missing software feature not deployed, etc.). If companies want to achieve greater gender diversity in leadership, they need to make it a business priority to do so. McKinsey & Co. for the past four years has been conducting a study on gender diversity in the workplace. The “Women in the Workplace 2018” study found that while women now earn more college bachelor’s degrees than men, ask for promotions at the same rate as men, and stay in the workforce the same as men, women are still underrepresented at every level at companies. Since the under representation starts at entry level, this results in fewer women to be promoted and thus fewer women in leadership roles. The study goes into more details as to its findings for the reason for the gap. The conclusion of the McKinsey & Co. study was that companies must make it a business priority to increase gender diversity at leadership roles. How do you think the female perspective benefits our company mission of changing patient lives? All types of diversity (gender, race, age, culture, etc.) benefit the mission of changing patient lives. It is important to work with teams with different perspectives so that the team does not fall into “group think” and end up agreeing to a solution which is not optimal. The end result of having a diverse team with diverse ideas is having different types of solutions considered so that the best solution will prevail. Work-life balance will continue to be a challenge for women. As more employees recognize the need for work-life balance, companies will need to continue to have workplace policies supporting that balance such as telecommuting, flexible work hours, and job sharing. To read other #WomenInSpine features from last month, click here to browse our ‘Culture’ section.